Three surgeries later we managed to get his bones back in their correct position. It was months and months before he was able to go to school without a cast. (That didn’t last long) Never once did he cry or complain. 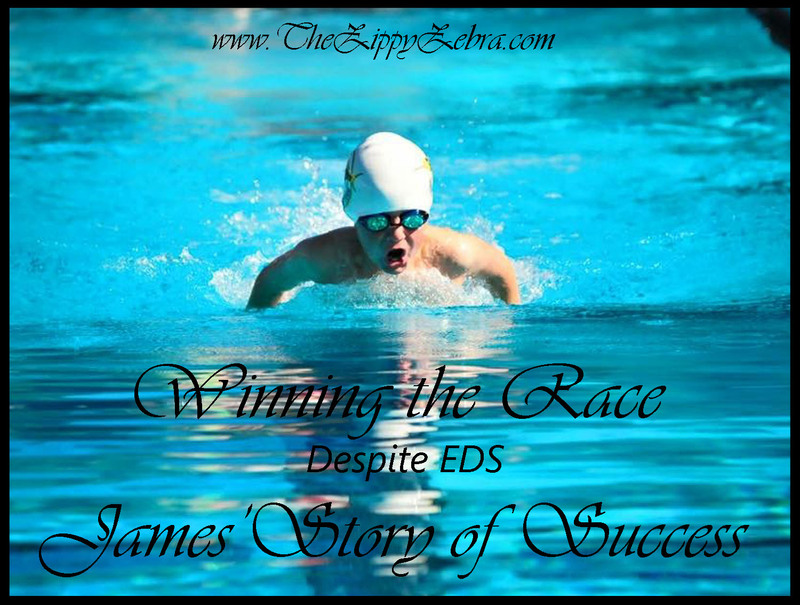 A few months later James joined a county recreation swim team that his brother participated in. He instantly took to the water. When he was swimming, he was home. 10 days before championships, where he was seeded to take home the win, he walked in and asked me if I had his arm brace in my purse. What Mom carries that in her purse? I asked him why and he held up his arm. His ulna was sticking out the side of his arm. Off to the pediatrician we went to get a referral to a surgeon. That’s where our journey began. Our first surgeon was amazing although he wanted to cast him right away. James must have reached down somewhere deep inside but he blurted out “No! I have swim championships in a few days and I am going to win!” The surgeon, who turned out to be a swimmer himself, put him in a removable brace and said “If you promise to wear this until you step up on the block, take it off to swim and have your mom put it back on as soon as you return to the wall, I won’t cast you.” James kept his promise, swam, won, and returned 10 days later for a follow up. Our surgeon then gave us good news and bad news. The bad news was he was leaving to another medical group and that would be our last visit. The good news? He set us up with a buddy who makes custom waterproof casts. Our journey to find a new surgeon started. In fact, we went through 8 more. They would look at his films (X-rays, CTs, MRIs) and think they didn’t look bad. Then they would look at his arm and freak out. You could literally pull his ulna out and twist it. It was not connected (so it seemed) to his body. He was a case study for our state’s surgeon conference. When James stumped them, it went on a national level. When we stumped them, his case was sent to other continents around the world. They had no idea what to do with him. In the meantime, James continued to swim with his custom waterproof casts. He continued to grow and catch on like one couldn’t believe. He could flawlessly execute the butterfly stroke with grace and rhythm that most people won’t ever achieve at 6 years old. He could move through the water like an eel. Surgeon #9 was the answer. She, on a whim, sent James to genetics. The answer to all of our questions over the years finally were answered. James had EDS. That explained his breaks. It explained why his bones would come apart. It explained why he was so slim and lanky and could bend in ways that make contortionists cringe. It explained how he could manipulate himself through the water like a 50 pound Michael Phelps. How did James cope? He swam. Day or night he could be found in water. Every 6 months he has new casts made. He continued to improve daily. He works harder than any kid I know. His surgeon explained that the earliest they could do any type of surgery is when he is 12. Today he is 9 and in 4th grade. He has yet to go to school since kindergarten without a cast on his arm. He’s kind of known for it at this point. 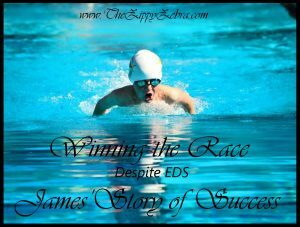 James has been our inspiration not only in our home but our town and to other swimmers. James has switched over to a full time USA team and in less than a year has become an accomplished swimmer already. He’s competed in two Junior Olympics, has been featured on TV, was given a Proclamation by our mayor and city council, swam from San Diego to Coronado, and his favorite accomplishment of all… At the ripe age of 8, he made the famous swim from Alcatraz Island. 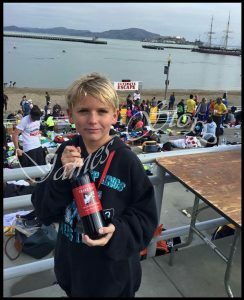 In fact, in about five weeks, he will be breaking a world record by being the youngest person to ever swim from San Francisco to Alcatraz and then back! We are so proud of him and his accomplishments. His hard work, dedication, and drive can’t be topped. Syndrome or not, he won’t be stopped. 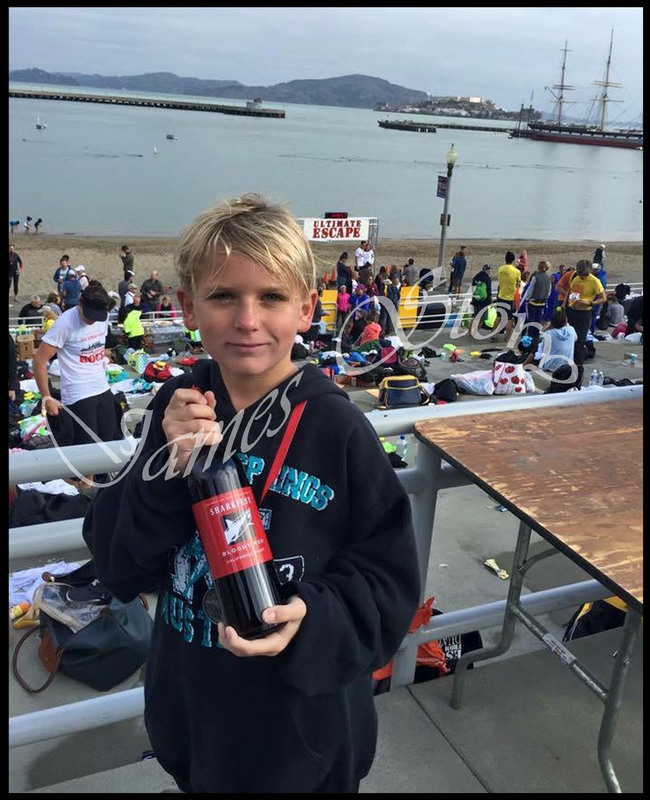 UPDATE: James just completed a record breaking swim to Alcatraz. Read about it here.